Hello y’all! I can’t believe we are finally officially in SPRING! It’s time to plant new flowers, have the semi-annual fight with pollen (ha), fork out the warm weather clothes, and well…have more parties! When it comes to hosting family and friends in our home, I’ve learned that simpler is better. I used to make elaborate meals for parties, but it’s hard to enjoy a party when you’re stuck in the kitchen the whole time! I really only go all-out for Christmas or Easter. Other than that, I prefer to stick with easier recipes. I especially love spring, because typical spring parties = crawfish boils in Louisiana. However, sometimes the guests come hungry (way before the crawfish are finished), so a quick/easy dip recipe that stays warm in the slow cooker is just the ticket! Brown the sausage fully in a pan. 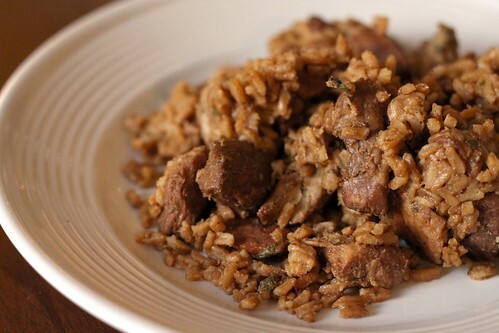 Once the sausage has fully cooked, drain and discard the leftover fat. Add the cubed Velveeta and cream cheese to the pan with the sausage, and cook/stir on low heat until the cheeses have melted. Add the drained tomatoes, corn and seasoning to the pan, and mix until fully incorporated. Transfer the dip to your slow cooker and set the slow cooker to warm. 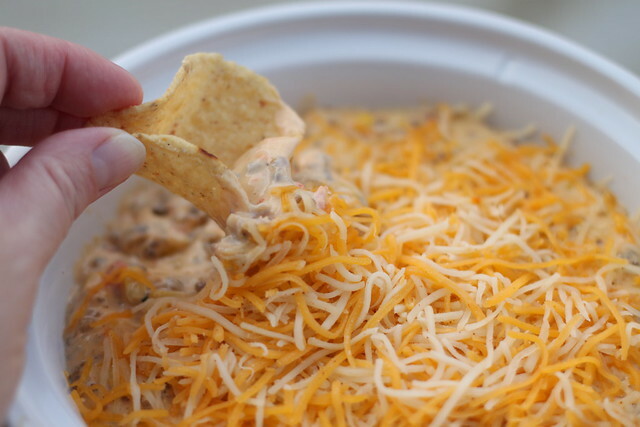 Sprinkle the cheese over the top of the dip. 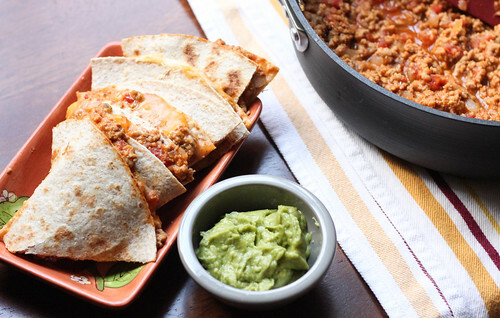 Cover, and serve with tortilla chips after the shredded cheese starts to melt. Blueberry Margaritas + Blue Cheese Guacamole! Disclosure: This is a sponsored post, on behalf of Corralejo Tequila and Cheese of Europe. I was compensated for this post, and all opinions are 100% my own. Please drink responsibly. Happy Cinco de Mayo, y’all! I’m not sure how we got to May, but I’m not complaining! We’re so close to summer, and while I’m no longer in school, I’m looking forward to no more school traffic and a happy thing for food bloggers — more sunlight! When it comes to Cinco de Mayo, I have to have something tex-mex. It just feels right. So, I made some guacamole and not just any guacamole…I made blue cheese guacamole! I just love a good, chunky guacamole. 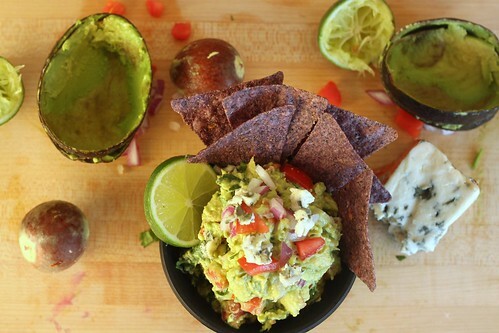 This recipe is a twist on a classic — just crumbling in some tangy, slightly-spicy Roquefort (blue) cheese brings this guacamole to a whole different level! It’s fantastic, and it couldn’t be easier to make. Place the avocados in a medium-sized bowl and mash the avocados with a fork. Place the rest of the ingredients in the bowl with the avocado, and mix until everything is well-combined. This is the first time I’ve ever had Corralejo tequila, and their Reposado paired really well with blueberry. Confession time: I didn’t really know much about how tequilas were made until recently. Corralejo Reposado is aged four months in barrels, which are made from three types of wood including French, American and Mexican Oak. Corralejo Silver is bottled fresh from the distillery. Now, as far as the margarita goes, this margarita didn’t have a jalapeno flavor…rather, it just gave the drink a slightly spicy kick. 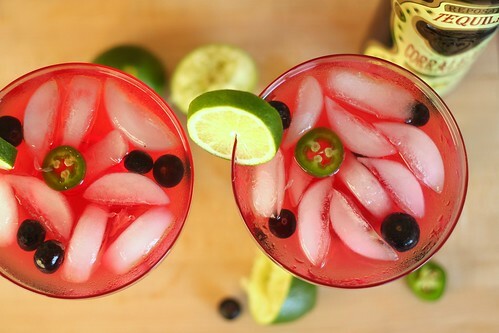 To make the drink, I made a blueberry simple syrup, and added that to the tequila/triple sec/lime/jalapeno. 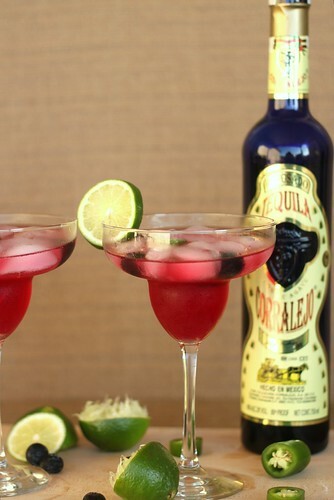 That way, you can easily control how sweet/blueberry-ish you want your margarita to be. To make the simple syrup, heat the blueberries, sugar and water together in a medium saucepan, stirring and mashing the berries as the mixture cooks. Cook the simple syrup until the sugar has fully dissolved. Turn off the heat and set aside until fully cooled. Once the mixture has cooled, put the blueberry simple syrup through a strainer and into a large jar. Discard the blueberries that strain out. Disclosure: I was provided with samples of G.H. Cretors products, in exchange for a post. G.H. 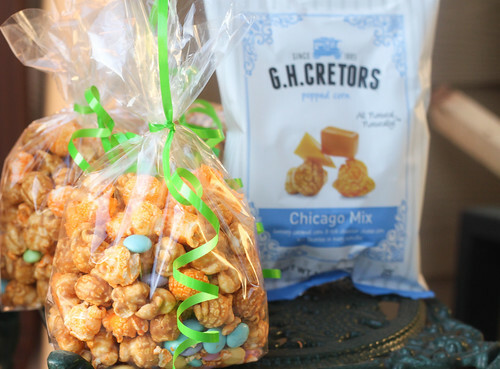 Cretors is also supplying the prize for the giveaway. All opinions are 100% my own. I used to be an avocado hater. There…I said it. When I was a kid, I thought they had a weird texture and tasted kind of bland. It took me until college to give these a try again, and it was in the form of guacamole. Avocado quickly became one of those foods that I learned to love as an adult. If something has sliced avocado or guacamole in it, chances are I’m gonna go for it. As easy as it is to throw together some guacamole, I have to admit that I was stoked to find out about Wholly Guacamole’s products. 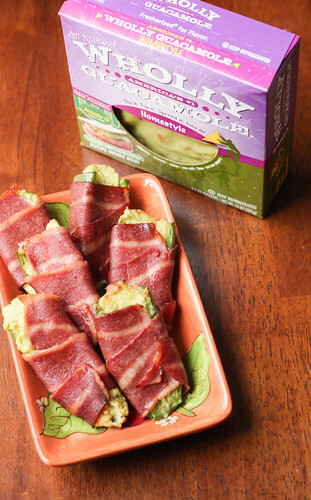 I first discovered Wholly Guacamole products on a whim at the grocery store. When I started calorie counting, I basically walked all of the aisles of the grocery store to find snack ideas, and I came upon their 100 calorie guacamole packs. While I could definitely eat a whole batch of guacamole, I loved the idea of having it pre-portioned in a small amount. 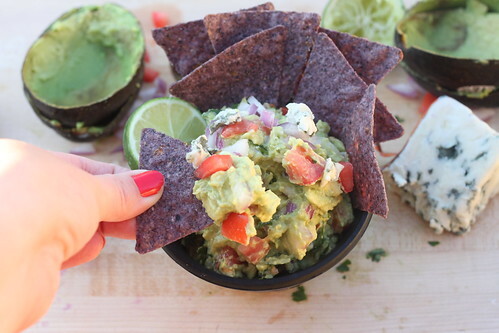 It’s the perfect dip for baked tortilla chips and veggies! Well, HELLO JULY! So many wonderful things going on this month: July 4th, my best friend’s wedding (OMG…hope my bridesmaid dress still fits after the 4th haha! )…well, that’s basically it. However, those are two HUGE events to me. I love the 4th of July. LOVE. The fireworks, the smell of the grills going crazy in our neighborhood and celebrating the holiday with All-American classic dishes. It’s just great. 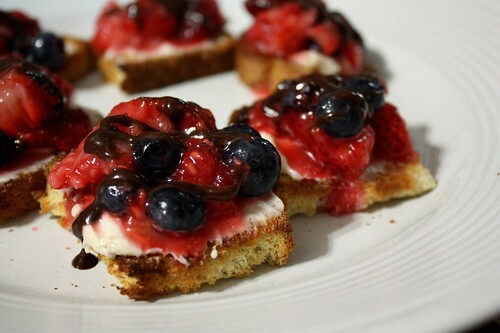 I’m pretty sure I wake up on July 4th craving food from the grill. Wonder if my husband would grill breakfast for me….LOL! One of my favorite All-American dishes is sloppy joes. My Mom used to make sloppy joes a lot when we were kids, and the klutzy person in me loves the fact that the food is naturally sloppy. Whenever I go out to eat, I end up with a line of food around my plate. I’m not a neat eater at all. I’m sort of a disaster in public…I’m surprised people take me anywhere. Any food that says it’s sloppy means no judgement if I make a mess, right? Right. I’m sure I’ve mentioned that my parents’ green thumbs never passed down to me. My mom is a horticulturist, and even teaches courses at a local college. My dad is a pro veggie gardener (learned from growing vegetables for years), and can grow a mean crop of tomatoes. My parents make gardening look easy, but for me? I’m the plant killer. I really wanted to make my own pickles out of these cucumbers, and since the cucumbers were just ridiculous, it only took 1 to fill up 3 pint sized mason jars. 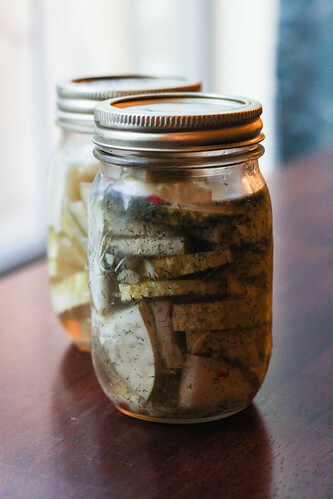 I especially love the idea of making fridge pickles, because I could leave the canning supplies in the pantry and basically throw these together very quickly. These pickles are just so flavorful, and the wonderful thing about fridge pickles is that they are just unbelievably crisp. They lend an awesome crunchy texture to an otherwise average sandwich, and are also a pretty awesome snack on their own. Slice the cucumbers in 1/4 in.-1/8 in. thick slices and add them to mason jars or a large bowl. Cut the garlic cloves into quarters and using a knife, gently smash them. Evenly add the garlic pieces to the jars or bowl. In a small pot, heat the remaining ingredients until the sugar and salt are dissolved. Pour the liquid over the cucumbers and garlic and cover the containers. Refrigerate the pickles for at least 2 hours before eating. I love hosting big family holidays. I have a blast choosing a menu, shopping and waking up early to start the cooking festivities. It’s really rewarding when you see all of your loved ones gathered around and enjoying the food that YOU made! Never in my college day Lean Cuisine eating dreams did I think I could ever host a family holiday, but we have…quite a few times. Melt the butter in large saucepan on medium-low heat. Add the chopped onion and sauté the butter and onions until they are translucent and soft, about 5 minutes. Add in the spinach, artichokes, cream cheese, sour cream, ¾ cup of the parmesan and ¾ cup of the Monterey jack, Tabasco and salt (to taste). Cook until well mixed. 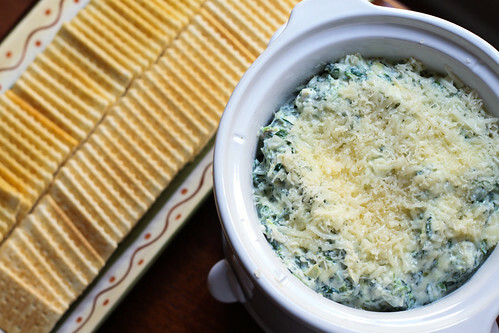 Pour the mixture into a smaller crockpot and sprinkle the remaining cheese on top. Add the lid to the crockpot and heat on low for about 20 minutes, until the cheese is just melted. Then, keep the crockpot on low throughout serving. Part of me cannot believe that the Superbowl is Sunday. I mean, that’s the end of football season until next Fall. I have to wait at least six months to watch another game after this. Sad. (If you know me, you know I’m being dead serious about how sad this is to me. Crazy football fan here!) A perk of Superbowl Sunday? Watching Millie run up to the TV when I randomly switch over to the Puppy Bowl. 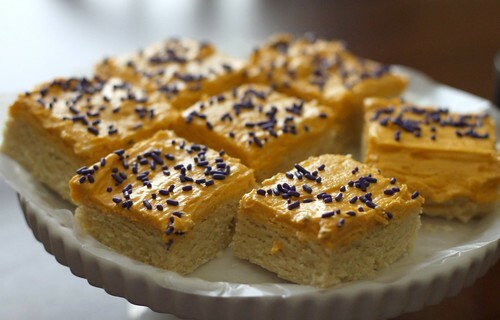 To mourn celebrate the end of another football season, here’s some great recipes that will definitely disappear if you serve them at your Superbowl parties. 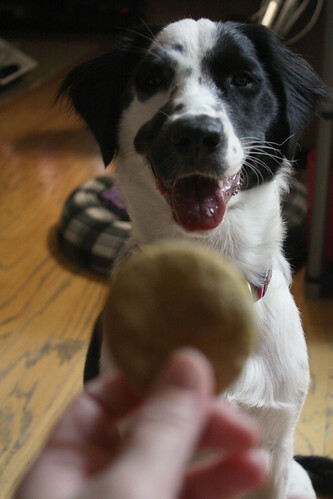 Oh, and if you have an occasional puppy bowl break, I’m pretty sure the dogs at your party would love you for these! Greetings from our new kitchen! We’re still unpacking boxes around the house, but the kitchen is completely set-up! The kitchen was definitely a priority for us when it came to unpacking, because take out was definitely starting to get boring. Since we moved a little further from the city, our choices are VERY limited. So yeah, it was time to turn on that stove! Since I was in the mood to make tex-mex (and H didn’t really mind that craving either), we made chicken enchiladas one night and then chicken taquitos with this salsa the next night. Tex-mex two nights in a week? Heck yes! 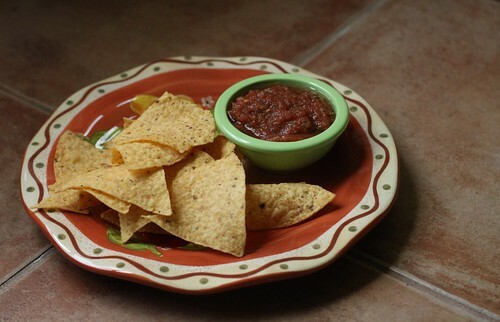 This salsa is really a big favorite in our house, and I’m really not sure why I haven’t shared this recipe with y’all until now! We’ve made it quite a few times, because it’s ridiculously easy to throw together and way tastier than anything you can buy in a jar! While this salsa makes a lot (and I mean A LOT), it’s really not difficult to go through this stuff fairly quickly. 🙂 It’s addictive, for sure! Take all ingredients and put them in a blender. Pulse the blender until you reach your desired consistency. My husband and I really love a good bowl of queso blanco. Whenever we go to a tex-mex restaurant, we have to order the queso, and it never fails to just hit the spot. Sometimes, I even wonder why I order a dinner…it’s the queso that I’m really after! I really wanted to know what type of cheese was in the queso, so I’d research and various folks would mention mexican cheeses that I’ve never worked with, so I was intimidated. Plus, I tend to have trouble trusting people on random forums, like Yahoo! Answers. Why waste my time. Then, I saw a post on Confessions of a Foodie Bride about making this infamous queso, but the cheese totally threw me for a loop. White American? Really…that’s it? So, I had to give this a try, because I love Shawnda’s blog, and I knew she wouldn’t steer me wrong here. Y’all, this is restaurant queso blanco. I’m not lying. 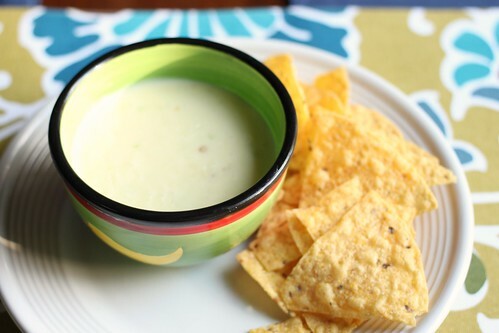 If you want queso blanco at home, make this…you won’t regret it. 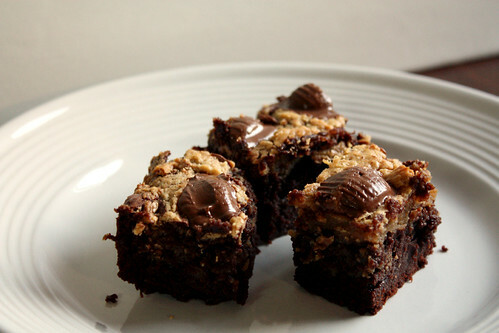 We definitely loved this recipe and it couldn’t be easier to make! Heat the oil in a pot. Add the onion and pepper and cook until until softened and reduce heat to medium-low. Add the shredded cheese and 1/4 cup of the cream. Stir until well combined and mostly melted. 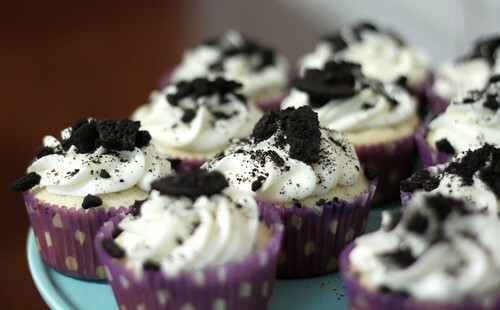 Add in additional cream a little at a time until you reach desired consistency.